gUnattended will cause VIs leaving memory during GetInstHandle to get saved automatically. This is dangerous. The "MstrWiz" part is interesting, because it brings to mind the fantastic-sounding "Master Wizard" class that shows up when you enable scripting, as well as some other stuff I've seen. Most relevant is the "External Editor Wizard" private method on block diagram refnums, and the scripting class of the same name, neither of which I've been able to figure out how to do anything with. (Though one of the properties on that class refers to a "master container structure", which is interesting because of the structure-like behavior.) 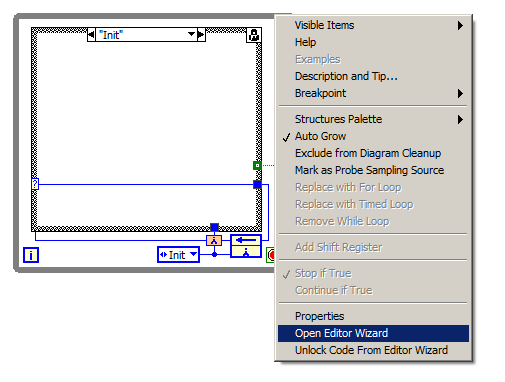 It also reminds me of the mysterious Open Editor Wizard menu item string I found in the resource files. By the way, since a lot of this stuff is just scripting and not private, I figure someone will know something about it. What I find most strange however is the fact that I haven't seen any information about the "VI is External Editor" menu item. At first I assumed it was an NI-internal feature enabled by one of the various options I have turned on in LabVIEW.ini, but the option remained there even after temporarily renaming my LabVIEW.ini file to restore the default options. I even disabled a certain XNode development-related file I have installed (I'm sure some of you can guess) in case that was also enabling it but nope, still there. Does everyone else have this option? If not, does anyone know why I do? What is the option for? My guess (though it's just a guess) is that if the VI has the correct connector pane, I can drag that "structure" box around some stuff, and then it will run that VI to perform some scripting action on the selected objects. When I turn it on for a subVI, it makes it so placing that subVI from the palette instead behaves as if I'm creating a structure,﻿﻿ changing the cursor and allowing me to mark a rectangular area. When you edit a palette set, there is an option of "Place VI Contents" when right clicking on a VI, which will drop the code contained in the VI rather than the VI itself (like a template). Maybe it has something to do with that. Yeah I know about that; I actually noticed it as I was turning that option on for something. I just tried it with both options enabled and it just places it with the contents, and nothing interesting is logged. I don't think it's related. Do you have the "VI is External Editor" option? OK, just discovered something big! (Well, big as far as this mystery is concerned anyway.) I did a "dir /s *wiz*" in my LabVIEW directory, and found a folder called "ExternalEditors" in "resource\plugins". I put "<LabVIEW>\resource\plugins\ExternalEditors\StateDiagramEditor\StateDiagram.vi" in my palette and turned on that option, and yep, it worked. It's actually pretty interesting; it's a little graph editor thing that generates a state machine loop structure. And the structures have a little icon on them too showing they're still linked to the editor so you can open it again for further editing. And how do you open it again? So there's another mystery solved. Now yes, VIM's existed in a semi-official capacity in earlier versions of LabVIEW as well. But they were implemented using XNodes, so I don't think they existed back when NI was still using External Nodes. So here's a .mnu file that has StateDiagram.vi with this turned on, as well as a nonexistent ExternalEditors\MyEditor\MyEditor.vi that you can create and experiment with. Not sure how to get it to work yet. Okay so I don't fully know if this is what you are dealing with but I think this has to do with the State Diagram Editor. NI had a toolkit called the State Diagram Editor back in the 7.x era. It was a toolkit which had a graphical UI for making states and defining what made states go where. It had a single ExternalNode for assisting in the code which determined what state it should go to. It wasn't completely required but did make life easier for the most part. NI later saw the value in this type of editor and made a new toolkit the State Chart Module which had some similar functionality but wasn't quite the same. Well after years of complaining (from Ben primarily) NI decided to release the State Diagram Editor. I thought they replaced the ExternalNode with a VIM but now that I look at it that doesn't seem to be the case. You can find the State Diagram Editor on the Tools Network installed through VIPM. Then you can drop down a new state machine and edit it either in the image control (and the code will be updated) of you can edit the code and the image will be updated. Still there are a few things I don't like about it like type defing those enums causes problems and I think crashing. @ShaunR, I just realized it says you're using LabVIEW 2009. Is this the version you checked for that menu item in? Maybe it wasn't added until a later version. I was actually working in 2013 at the time but have just checked 2018 and it is indeed in there. So it was obviously added after 2013. OK, thanks; I guess there probably isn't anything special that needs to be done then in order to enable it. Or is there some kind of special configuration you've done that might have enabled it?